Download Cliffhanger in Digital HD from the iTunes store. Listen to the Cliffhanger soundtrack on Apple Music. Cliffhanger images are © 20th Century Fox. All Rights Reserved. Sylvester Stallone (Rocky) had a string of hit action movies in the 1970s and 1980s but those hits waned by the latter part of 1980s and he didn't make movies for a few years. Then in 1993, he starred in another action film called Cliffhanger. Based in the mountains of the Northwestern United States and filmed in the Italian Alps, the Renny Harlin (Die Hard 2) directed movie had audiences thrilled to see Stallone back to the action hero he was before. Twenty-five years later Sony Pictures has decided to release the film on 4K so it is headed to stores the middle of this month. Gabe Walker (Stallone) is a mountain ranger with a skill for climbing and rescues. HIs girlfriend Jessie (Janine Turner; Northern Exposure) is a helicopter pilot who works with him and his best friend Hal (Michael Rooker; Guardians of the Galaxy) making rescues. When Jessie and Gabe find themselves rescuing Hal and his girlfriend, Sarah (Michelle Joyner; Outbreak), things go terribly wrong and Sarah ends up falling to her death. Hal blames Gabe for the tragedy fracturing their friendship forever. Eight months later we see Gabe returning to the mountain simply to get the rest of his things from Jessie and severing ties with his past. While there a distress call comes into the ranger station and Jessie begs him to help since he knows those mountains better than anyone. When Gabe reluctantly agrees finally, he finds himself with Hall caught up in something much more than they ever could have imagined. It turns out there weren't any lost hikers in need of rescuing but a group of plane hijackers in need of someone to help them find their lost money. Playing a deadly game of cat and mouse Gabe must find the money before they do and save his friends from the robbers headed by Eric Qualen (John Lithgow; 3rd Rock from the Sun). There is no denying that Stallone is one of the true action heroes of our generation and Cliffhanger reminds us why that is. Physically he was in top shape for this movie and the scenes of him climbing the mountains were impressive. Turner is an excellent compliment to him and they seem to have an easy that would make it believable that they had been romantically involved. Rooker completes this triangle nicely and Lithgow is strong as the villain in this tail. Unfortunately, the 4K upgrade isn't exactly kind to the film as the heightened detail makes some of the backgrounds look fake. Conversely, the colors are spectacular and when the views are real they are magnificent. However, the Dolby Atmos audio fares much better with the sounds surrounding the viewer from all sides. The 4K disc doesn't house any of the extras and the Blu-ray has the same extras that were released eight years ago. 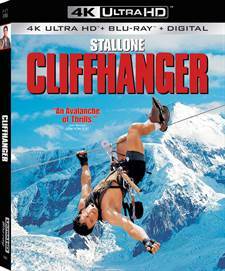 These include: Audio Commentary with Director Renny Harlin and Actor Sylvester Stallone, Audio Commentary: Technical Crew including Editor Frank Urioste, Co-Visual Effects Supervisors Neil Krepela and John Bruno, and Production Designer John Vallone., A Personal Introduction from Renny Harlin, Deleted Scenes, Stallone on the Edge: The Making of Cliffhanger, Special Effect, Storyboard Comparisons, Original Theatrical Trailer, and Previews: Additional Sony titles. If you are a Stallone fan and enjoy watching him as the action star he generally is then you would want to own this title in 4K. 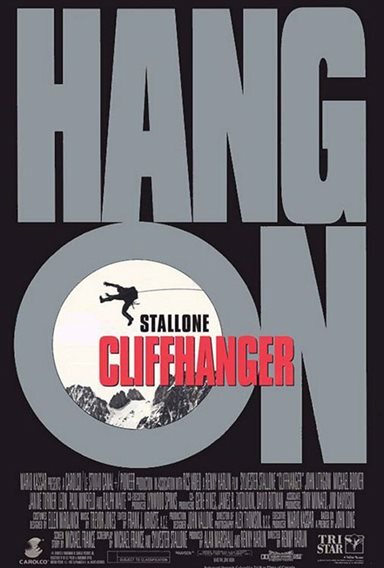 While the dialogue is cheesy and the story little too far fetched for my taste, Cliffhanger offered some great actions sequences and an always excellent performance from Lithgow.